Lamarche’s investigation of visions in city planning, architectonic surfaces, public space, urban vegetation, and weather phenomena, his excursions into high and pop culture are closely connected to questions of representation. While his works reference the reduced and abstract formal canon of modern art and architecture and the theoretical approaches of conceptual and minimal art, they are always based on an element of the fantastic, theatrical, and burlesque. Lamarche’s usage of artificial fog, mirrors, light, and projection is characteristic for his sculptures and closed-circuit video installations; he always lends an ambivalent, performative character to the material he appropriates from his scientific and historical research, which is often static,functional, and geometric. In a sense, Lamarche takes the rigid and primarily male-dominated ideologies and claims to power manifested in the history of modern art and architecture and presents them in drag—as a sign for the construct of cultural and sexual identity in continuous metamorphosis. In this regard, Looping Kate Bush Remix (2011), the video and sound installation at the core of the current exhibition, is equally inspired by kinetic art as it is by personal longings and processes of development. “The Kick Inside” backwards and listening to individual sections over and over again in order to generate the perfect loop from them. In Looping Kate Bush, this experience of being completely trapped in the projection of a potential female self, this constant replaying of the same record, the repetition of moments and feelings and their simultaneous analysis become compressed into a mixture of dream machine, light space, and hypnotic prison. 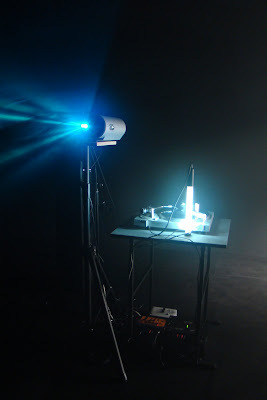 In the process, Lamarche uses a technique that is related to Brion Gysin’s psychedelic Dream Machine: a metallic cylinder lit by an inspection lamp is placed on a turntable and made to rotate at 33 rpm atop a record with a Kate Bush loop. This is filmed by a webcam mounted onto the record player that projects the image live via video beamer onto a screen. In tandem with the reflective cylinder’s rotation, the beamer’s projection ray wanders around the room. Lamarche lends a physical dimension to the projection of desire. Through an interplay of sound and light, he creates artificial feelings and movements that are both interior and exterior, while the constant repetition gives rise to a loop in real time in which acoustic and spatial perceptions merge.